As I did in March and June, I wanted to highlight some recent and exciting updates to some of my earlier articles. There is so much recent snake news this month, which is lucky for me because I've been writing my dissertation, which I'll be defending next month, so I haven't had much time to write. anything else! I hope to return to longer-form content in October. 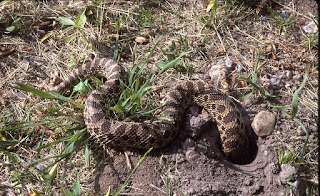 Also, although I rarely promote my own research on this blog, I'm very excited to have just published the second chapter of my masters thesis, documenting the diet of Western Hog-nosed Snakes (Heterodon nasicus) in Illinois using stable isotopes to quadruple our sample size. We showed that the diet of juveniles was composed mostly of Six-lined Racerunners (Aspidoscelis sexlineata) and their eggs, whereas adults mostly feed on aquatic turtle eggs! 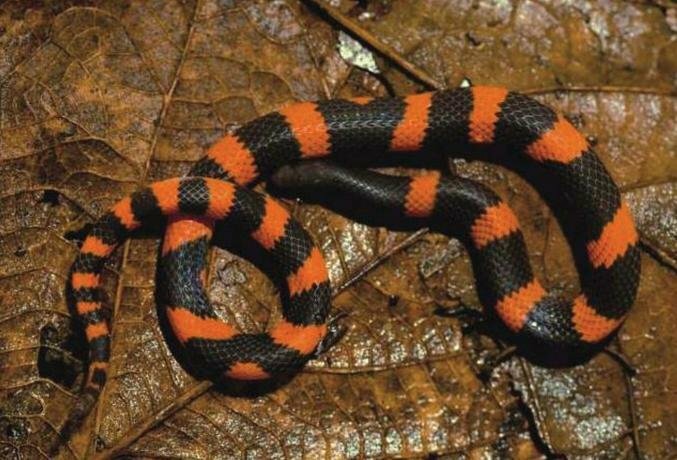 Surprisingly, we found very little evidence that these snakes were eating amphibians, which are considered to be staples of their diet elsewhere. Researchers from the Gulbenkian Institute of Science in Portugal used data from the king cobra and Burmese python genomes as part of new research that's too meta for me not to write about. 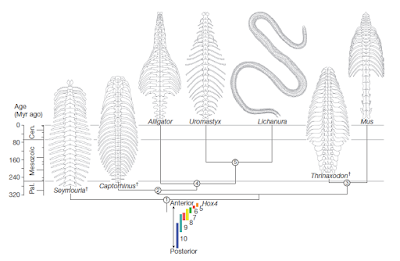 The developmental biology of snakes deserves a whole article (and, indeed, is the subject of an entire book chapter), but snake development is uniquely interesting from the perspective of understanding the evolution of both limblessness and body elongation. 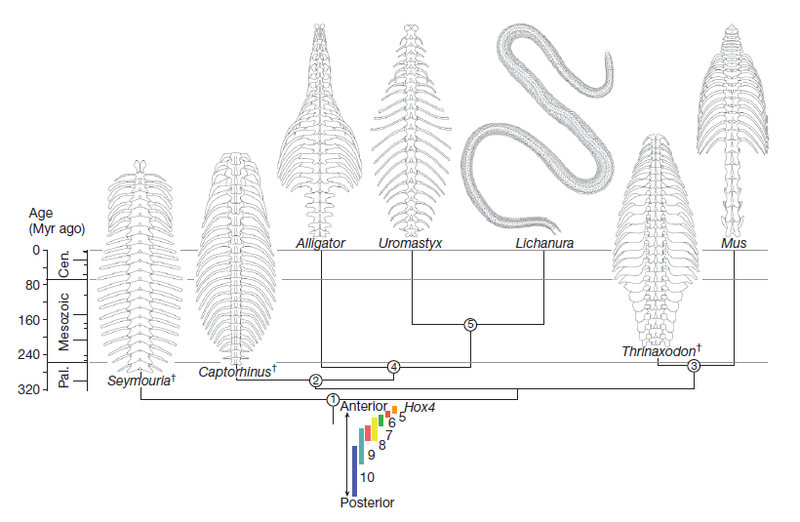 A very recent article in the journal Developmental Cell shed light on the genetic regulation of body length in vertebrates, which varies from a dozen or fewer in humans and most vertebrates to over 200 in many snakes and caecilians and exceeds 400 in some snake species. For a long time, scientists thought that Hox genes, which control many aspects of body layout and development, probably controlled body length too. But, so far experiments modifying Hox genes have failed to produce differences in body length, and most snake Hox genes are not substantially different from those of other vertebrates. Instead, the new study showed that the "junk DNA" surrounding a different gene, called Oct4, apparently influences body length in developing vertebrate embryos. Although the Oct4 gene itself was already known to play a role in regulating stem cell flexibility, the surrounding DNA was formerly considered to be "junk DNA" because it was not translated into RNA and seemed to have no purpose. Measurements showed that Oct4 is active for longer in developing snake embryos than in mouse embryos, which is probably what causes their bodies to grow so long. And, just by copying snake "junk DNA" into mouse embryos, the researchers were able to artificially increase both the level of expression of Oct4 in mouse embryos as well as the length of their bodies. Comparing the genomes of snakes, lizards, and mammals showed that the Oct4 "junk DNA" of snakes differed from that of lizards and mammals. Interestingly, glass lizard (Ophisaurus) Oct4 "junk DNA" was similar to that of geckos and anoles, even though these limbless lizards share an elongated snake-like body form with snakes. 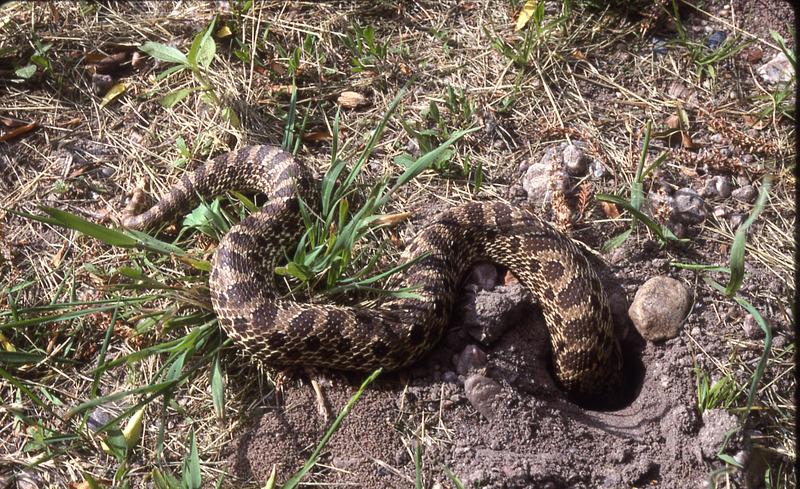 Many snakes make seasonal movements to and from hibernacula, in search of food or mates, or for other reasons. Often, we think of these movements as driven by the changing of seasons, either the wet and dry seasons in the tropics or the four well-defined temperate seasons. But, we don't know much about the seasonal movements of snakes that live in tropical and sub-tropical zones. For a species with such a small range, Eastern Indigo Snakes have fairly different requirements in the northern part of their range, where frosty Georgia winter nights force them to rely on deep, warm Gopher Tortoise (Gopherus polyphemus) burrows, and in sub-tropical peninsular Florida, where they are less reliant on such particular shelters. A recent study by a group of Florida scientists, including Orianne Society staff, used radio-telemetry to document a seasonal pattern of movement in Florida Indigo Snakes that differs from their pattern in Georgia. In particular, male Florida Indigos are most likely to move in the late fall and early winter, when they are searching for mates, whereas both males and females stay put during the spring, for reasons yet unknown. In contrast, Indigos in the rest of their range maintain small winter home ranges on xeric sandhills but use much larger home ranges and a greater diversity of habitats during the rest of the year. Global all-taxa citizen science portal iNaturalist's observation of the week this week was a very rare snake indeed, a photograph of Langaha pseudoalluaudi. Less than two dozen other individuals of this species have ever been found by scientists. The first was collected in 1966 and described in 1988, and the second individual was photographed in 2003 by a Durrell Wildlife Conservation Trust biologist. Since that time, a handful of other records have trickled in from the field in Madagascar, including a few photos on Flickr and the only known photo of a male, published in a field guide in 2007. This individual was found by group of Operation Wallacea volunteers on a conservation research expedition, one of whom, Victoria Jackson, a student of Biological Sciences at the University of Exeter, posted it on iNaturalist. Of the three species of Langaha, none of which are particularly well-known, L. pseudoalluaudi is by far the rarest and most poorly-known. Perhaps the most fascinating aspect of Langaha biology is their obvious anatomical sexual dimorphism, a feature that is very rare among snakes. 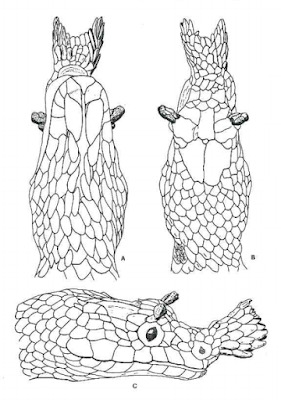 Females of all three Langaha species have a serrated snout that resembles a small flower that has not fully bloomed. 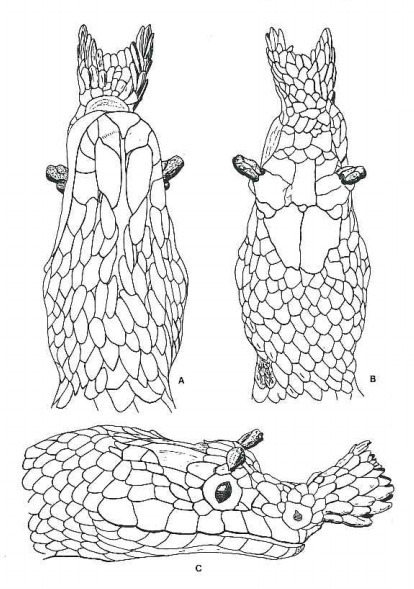 Female L. pseudoalluaudi also have protruding horn-like scales above their eyes. Males have smooth, pointed snouts instead that resemble the seed pods of a Madagascan legume. We have very little idea why these snakes might be sexually dimorphic—the nose ornaments could be shaped by sexual selection, or they might function to make the snakes more cryptic to predators or prey, if the sexes forage or hide in different environments or on different foods. There has only ever been one study of sleep in snakes. It was conducted in France in 1969 on an African Rock Python (Python sebae), which produced sleep-like brain waves almost 16 hours a day, increasing to over 20 hours following feeding. 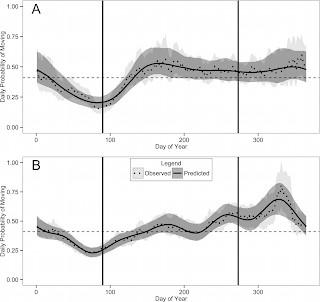 The data suggest that these brainwaves corresponded with slower breathing and heart rate, some muscle relaxation, and perhaps a lowered behavioral response threshold. There was no evidence for REM sleep in this snake. 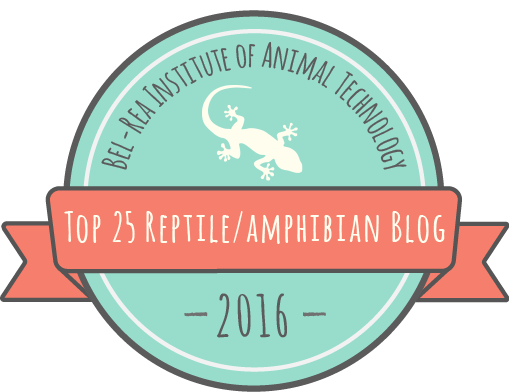 Evidence for REM sleep in other reptiles is mixed. 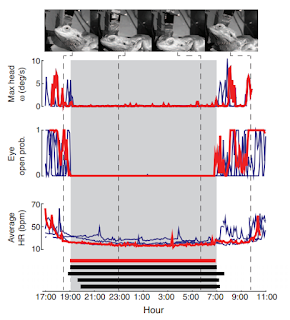 The April 29th issue of Science contained new data from the Max Planck Institute for Brain Research documenting slow-wave and rapid eye movement (REM) sleep in Bearded Dragons (Pogona vitticeps). [Edit 4/19/2017: This research has since been criticized for failing to exclude the possibility that putative REM sleep was actually partial or full awakenings from sleep, which looks very similar.] This is pretty cool because Bearded Dragons and snakes might be pretty close relatives (if phylogenetic trees using molecular data are to be believed) and it suggests that not only do reptiles definitely sleep, they may also dream. Previously, scientists had hypothesized that slow-wave and REM sleep evolved independently in birds and mammals and, like parental care, could be linked to endothermy. 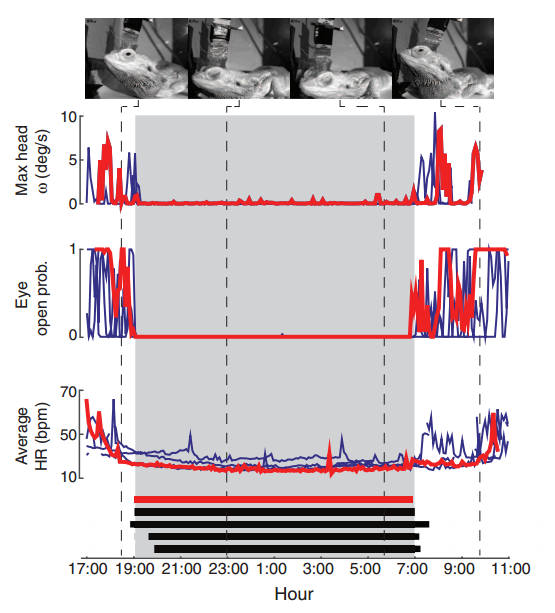 The unequivocal [see above edit] evidence for these sleep phases in reptiles suggest that REM sleep evolved much earlier and probably only once. The senior author on the study, neuroscientist Gilles Laurent was quoted as saying "If you forced me to speculate and to use a loose definition of dreaming, I'd speculate that [Bearded Dragon] dreams are about recent notable events: insects, maybe a place where there are good insects, an aggressive male in the next terrarium, et cetera. If I were an Australian dragon living in Frankfurt, I'd be dreaming of a warm day in the sun." Snake species number over 3,600 this month, in part because of the description of a new species of Geophis from Mexico. The beautiful Geophis lorcana is the 50th species in the genus Geophis and the 8th new species in that genus since the turn of the century. It was discovered in the cloud forests of the Sierra Zongolica and Sierra de Quimixtlán mountains by biologist Miguel Ángel de la Torre Loranca, in whose honor the new species is named. Like other Geophis, this snake is fossorial and secretive, and has a small geographic range. Further exploration of this region combined with molecular and anatomical data is likely to yield additional new species, although the habitats in which they are likely to be found are vulnerable to a variety of threats. Other new snake species from the past year include 10 new blindsnakes in the genus Epictia from Central and South America, a new boa from the Bahamas that sheds light on the island biogeography of the Caribbean, and a new species of Neotropical watersnake (genus Helicops) whose specific epithet is taken from one of Tolkien's Elvish languages. It's not peer-reviewed research, but a recent video from the Alice Springs Reptile Centre in Alice Springs, Australia showed an unusual occurrence—a shedding Stimson's Python (Antaresia stimsoni) that seemed to have gotten stuck inside of an endless loop of its own shed skin. 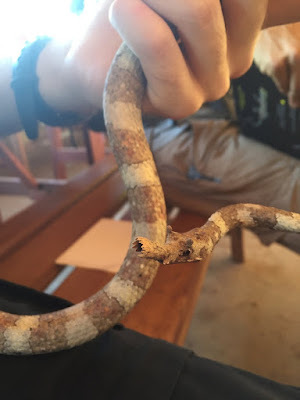 The snake must have crawled into the mouth orifice of the shed skin before it finished shedding the skin from the posterior part of its body. 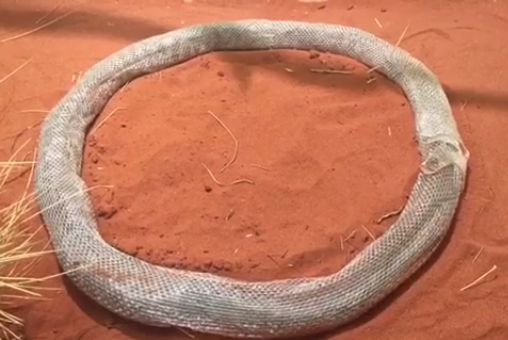 According to a Facebook post, the Alice Springs Reptile Centre staff reported that they had not observed this phenomenon before and that the python was able to free itself after about three hours of crawling in a circle by making a small, tidy exit hole in the shed. The video was featured on the popular IFLS science fan site. Thanks to John Iverson for the use of his photo.